How long should my life insurance policy be? Yesterday, we posted an article looking at how much cover we need when we take out life insurance. 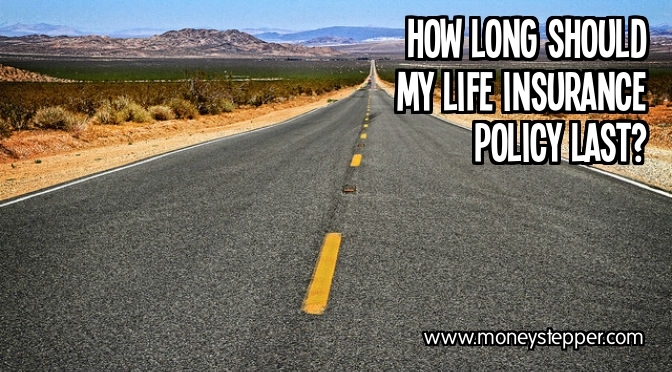 Today, we continue the subject by answering the question: How long should my life insurance policy be? Today, we will be addressing the other aspect of life insurance, namely the length of the term of the policy. Life changes. And, as such, I don’t personally think that you should lock yourself into long-term contracts as a general rule. This is equally a rule that I would follow for life insurance. When you complete a life insurance application, the box is usually pre-completed with 25 years, or some other very long term amount. However, my financial situation is clearly going to differ in 25 years’ time. Therefore, taking out a product today to cover this period doesn’t seem right. All of these things are variable and will change every year. Let’s look at a fairly “standard” example. Dave is a single lad after University and gets a fairly good job, including 4x annual salary death in service. He has no dependents and hence does not require life insurance. 5 years later, he gets married and the calculation suggests that he needs £50,000 cover. Therefore, he takes out a 25 year life insurance policy with £50,000 cover. 2 years later, he has a child and now calculates that he needs £125,000 cover. Therefore, he takes out another policy for the difference of £75,000 over a 25 year period. Another 2 years down the line, he has a second child and now his calculation says he needs £175,000 cover. Therefore, he takes out another policy for the difference of £50,000. Another 3 years down the line, he has a third child and now his calculation says he needs £200,000 cover. Therefore, he takes out another policy for the difference of £25,000. Let’s overlook the fact that Dave now has 4 separate policies and the hassle that this may lead to from a logistics perspective, and the fact he is probably paying much more than he would be if he only had one policy. Another 10 years down the line, Dave and his wife have built themselves into a financial position where if they did the calculation at that time, they would not need life insurance. However, they would still be paying on four policies every month that they do not need. Instead, we would recommend that people (especially those whose situations may change) take our shorter term life insurance policies. Is it any more expensive to do so? From this, you can see that it would actually be cheaper to buy shorter term cover. Is this effected by inflation? No. Whilst inflation will mean that the premium may be worth less, you would still be buying £100k of cover in the future which will also be less. It is therefore, in real terms, cheaper to buy shorter term products in this example. This way, as your situation changes, you can easily alter your life insurance product and your level of cover to suit your needs as they change. Even with short-term life insurance, you will want to re-perform your calculation each year (or when you have significant life changing events) to determine that you have enough cover. However, this will usually avoid significant problems with being “over-covered” as your net wealth improves and the needs of your dependents fall over time. Why Can’t I Find Cheaper Life Insurance Quotes? I am diabetic. Can I get Life Insurance? The only problem with buying short term life insurance is that while you gain flexibility, your term life insurance tends to get more expensive as you get older. So, while you could potentially drop some of your policies if your financial position dictates it, you will pay more for new policy. it would be interesting to see the price comparison at each 5 year interval and if it would be more cost effective to just take out a 20 year term. You may be overinsured, but I’d rather be overinsured than underinsured. So, I’d be paying an average of £6.55 per month if I buy short-term contracts every 5 years. However, if we are increasing our net wealth on a consistent basis, then I’d be disappointed if I need the same level of life insurance as a 40 year old as I did as a 30 year old. I bought a 30 year policy last year. Since I’ll be losing a free policy from my employer this year, I wanted to have one of my own. It’s not cheap, but it’s peace of mind for me and my loved ones. Nicely described about the importance of life insurance. It is always better to get long time insurance cover rather than short term. Longtime life coverage policy provides more benefits than short time coverage policy. Today you can easily make estimate online whether long time insurance policy is good or short time. Also note as you get older you may come down with a medical condition and that 5.6 a month would then seem dirt cheap as applying with a medical condition could push the prices up rapidly.